Mental illness is nothing to be taken lightly but like any other classification of illnesses, there are degrees — and as college football fans we (some more successfully than others) struggle to maintain our mental health through the ups and downs of the seasons and the withdrawals of the off-seasons. Like any other group of people, some football fans seriously need professional help. They tend to stand out in the comments sections. But even the most mentally healthy can use a little re-focus from time to time. A few mental health basics for football fans (from an admitted non-professional) is the subject of this week’s Three-and-Out. 1. Pitfalls of Vicarious Living. Vicarious living happens when we experience things through imaginative or sympathetic participation in the experiences of others. As sports fans this is more or less expected of us, but carrying it too far is a slippery slope. Diana Rodriguez wrote a great article which originally appeared on Examiner.com. The article examines the pitfalls of vicarious living relating to the parent-child relationship, but if you scratch out parent and write in fan and then scratch out child and plop in the name of your favorite team or players, it pretty much works for the fan experience. The article is well worth the read, and if you haven’t clicked on the link yet, I highly encourage you to do so. The mid-season loss to Arizona, while disappointing, was not the end of the world. The bottom line is that when we get too wrapped up in being fans, two things happen that aren’t good. First, we kiss off our own lives and ignore the opportunity to have our own wins and losses. Second, when we experience losses vicariously (National Championship Game, for example) there is a feeling of helplessness that pops up when our expectations are not met. This feeling is inevitable because, in fact, we are helpless. We are not players in the game, nor are we the coaches. 2. Bipolar Fan Disorder. It was a game a long time ago that made me first realize the existence of a condition that I have come to know as bipolar fan disorder, coincidentally abbreviated BFD. It occurs when we over-value the importance of the game, and much like regular bipolar disorder, the highs are too high and the lows are too low for our own good. Anyway — the game that brought this condition to my attention is a little fuzzy now, but as I remember it, it might have been Oregon-Stanford and it seems that Oregon was up something like 15-13 with Stanford about to kick a winning field goal. Of course I could be wrong about all of this, but it illustrates the point so I’ll go with it. As it happened, the kick hit the right upright and bounced harmlessly back into the end zone. While many fans went euphoric, I sat there wondering why I should be so darned happy that I could about pee my pants just because some nineteen-year-old I’d never met kicked a ball that sailed six inches too far off to one side. Enjoying the game and the outcome is one thing, but it’s best to keep it in perspective, because there is the downside…. 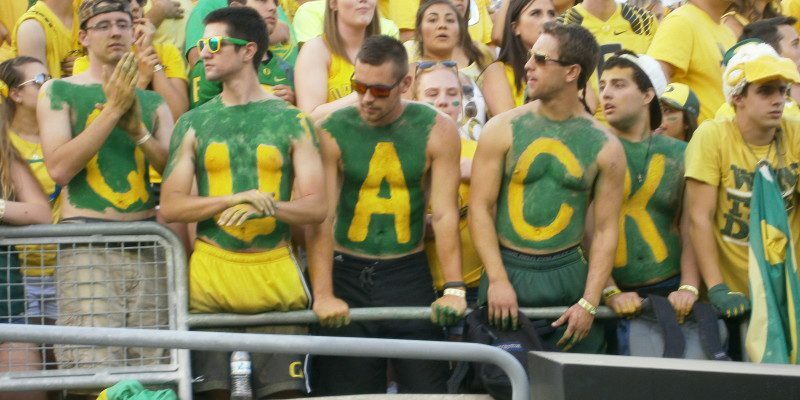 If Oregon fans are to go all BFD over a 13-2 season, what are fans of other teams not named Ohio State to do? Sometimes the other team’s kicker gets it right, or your team finds some other way to lose. Since the National Championship Game, I don’t think the week has gone by when someone hasn’t said to me, “Too bad about the Ducks.” Too bad? 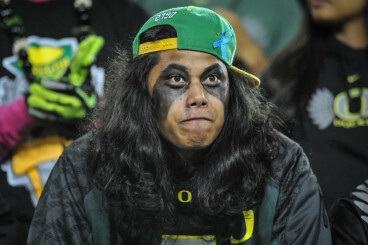 If it’s too bad for the Ducks, what is it for everybody not named Ohio State or Oregon? The outcome of the game was undeniably a momentary disappointment, but only somebody suffering from BFD could fret about it and start naming which coaches to fire. Again, the slippery slope. Vicarious living leads to BFD… and BFD leads to…. 3. Addiction. Here’s my favorite song about addiction. With the title, I’m just sure that it has something to do with football, although I’ve never figured out exactly what. But much the same as with BFD, there are two sides to addiction. 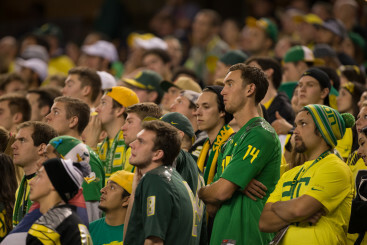 Husky fans appear optimistic before Oregon game. It’s good to support your team when it’s down, but again, when too much is invested, it becomes addictive behavior, specifically a gambling-type addiction. Picture the guy who has already lost all his money at those casino sites but just knows he can get it back if he keeps rolling the dice. Or picture the Huskies fans proclaiming, “This is the year,” and convincing themselves that it really is this time, only to be dashed once more. But there is also the euphoria of addiction — winning — and like the man says, “Kicks just keep getting harder to find.” Shoot, 6-5 used to work, then it got to where 8-4 left an empty feeling, and now even 13-2 just ain’t feelin’ right. At this point, true narcissism has set in. The fan wants his fix; he’s entitled to his fix; and if he’s not getting it, somebody’s to blame. The solution to avoiding this slippery slope? Have a life of your own. Revel in your own wins and losses. Know that your team and coaches are giving it their best shot… and recognize that in the end, it is their shot, not yours. As you would your children or anyone else who is dear to you, support them and give them your love, win or lose.